In recent years, microneedling, also known as collagen induction therapy (CIT), has become a very popular procedure in the realm of skin rejuvenation. The treatment produces visible results, there are few possible complications, and it is extremely simple—a patient can undergo a basic microneedling procedure in just a matter of minutes. Additionally, medical spa owners like microneedling because it is typically performed by an esthetician without supervision and without an examination, so the profit margins for these treatments are quite high. However, a growing body of legal precedent suggests estheticians should not be performing these procedures—in fact, it may be in your legal best interest to view microneedling strictly as a medical treatment. AmSpa members can login to see the detailed summary of medical aesthetic laws and regulations in their state. Generally, this procedure is very easy to perform and is mostly safe. Patients thus far have reported very few complications, and the few that have been suffered—a few cases of granulomas caused by the use of improper substances after the procedure, as well as a case of scarring caused by excessive pressure—have been the result of technician error rather than flaws that are endemic to the treatment. However, just because a treatment is simple and relatively safe does not mean that it is legal for non-medical personnel to administer it. Almost universally, estheticians are prohibited from performing medical treatments, which is typically defined as a treatment that breaks the outer layer of the skin. It would stand to reason that a procedure involving a needle also involves breaking the skin, so an esthetician should logically not be allowed to administer this type of treatment. However, the distinction of whether or not the skin is being broken is very difficult to make when you are dealing with tiny needles that are often mere fractions of a millimeter long. So at what depth is the skin broken? It depends on the patient, the part of the body being treated, and the amount of pressure that is being applied. Generally speaking, if blood is drawn, a procedure should be considered medical; it is not unusual for blood to appear during a microneedling procedure, regardless of how deeply the needles are meant to pushed into the skin. Obviously, this can be problematic. If microneedling is medical in nature, the patient must receive the same treatment that he or she would during a regular doctor visit. That means that a patient history must be taken, a licensed medical practitioner must conduct a patient history and examination, and proper supervision and delegation procedures must be observed. This makes the procedure far less profitable for the medical spa and much less convenient for the patient. The legalities of microneedling and similar procedures are not typically addressed explicitly in state rules and regulations, so medical aesthetic practices and medical spas have been more or less free to treat microneedling as a non-medical procedure. However, this view may soon be a thing of the past. 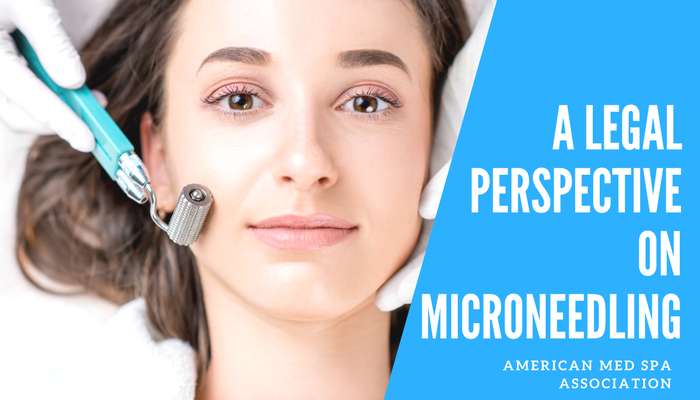 Recently, both the Illinois Department of Financial and Professional Regulation and the California Department of Consumer Affairs Board of Barbering and Cosmetology have issued statements that indicate both bodies view microneedling as an invasive—and thus a medical—procedure. Underwood also addressed the issue of needle depth. The California and Illinois boards are influential regulatory agencies, so it stands to reason that the industry will likely move in this direction. Because of this, it is likely a good idea for medical aesthetic professionals to begin treating microneedling as strictly medical in order to limit their exposure to penalties and legal action from regulatory agencies. If a practice previously used or currently uses estheticians to perform microneedling procedures, it runs the risk of incurring these penalties. However, coming to terms with the legal realities of this situation and conforming to this standard now will help educate employees about this new reality and shield the practice from legal issues in the future. In some states, however, there are ways in which individuals holding esthetician licenses can perform certain medical procedures. As noted in this video update, for example, many states differentiate between an esthetician and a person who is performing medical procedures under the supervision and delegation of a physician. This means that in some states if the patient is examined by a physician or a mid-level practitioner (such as a nurse practitioner or a physician assistant) then an individual working in a medical spa may perform microneedling provided they are trained, qualified, and properly supervised (please check your individual states regarding this rule as it differs widely across the country). It is very important to note for estheticians that if you are going to do this procedure under this caveat, you cannot represent yourself as an esthetician while doing so. This means flipping over your esthetician name tag and taking down any certification you might have hanging on the wall. Literally. In short, some states allows you as an “unlicensed person” to perform this procedure under proper medical supervision even though the Board of Cosmetology does not cover this under your license. This sounds onerous, and it is certainly involves more planning and infrastructure than a facial or another skin care service; however, depending on your state, this does not have to be a deal-breaker for offering microneedling services in your medical spa. The supervising physician doesn’t necessarily have to be in the room watching the professional perform the procedure and, in many states, does not have to see the patient before every treatment—just the first one. Many fully compliant medical spas don’t even have a physician on-site every day, but instead pick a day or two for new patient exams. Again, check your state laws for more information.